Spanish Immersion for Families: Learn Spanish on your next family adventure! Click the icons below to learn more about each of our Costa Rica locations for Family Spanish Immersion! Our Central Valley location is great for the family wanting to experience day to day life in the small, non-touristic town of Santo Domingo de Heredia, but still be close enough to the capital city to explore & be centrally located to get to all the tourist hotspots on the weekends. What to pack and what to not? Use this list to get prepared for multiple climates and activities without suitcases busting at the seams! Located on the southern pacific coast, Manuel Antonio is a great spot for families hoping to catch some waves (or some zzz’s on a white sand beach) and see lots of wildlife exploring the most visited national park in the country. The perfect Spanish adventure or family vacation to Costa Rica! Common Ground’s Spanish immersion for families in Costa Rica provides a safe yet adventurous time learning Spanish and experiencing another culture. In 2003 Rory & Leslie Foster (owners of Common Ground International) started running Spanish Immersion Programs for professionals and students, and as they had themselves a growing family, they began learning all the tricks of the trade to traveling to Central America with their children. After over a decade of travel to Costa Rica with their children, we have put together the trip that’s perfect for the family that wants to weave Spanish immersion into their vacation or travel plans! 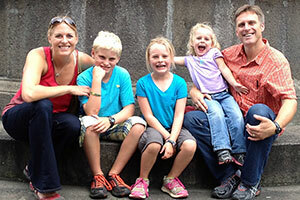 We’re a family-run business and we’ve been traveling with our children to Costa Rica since the day they were born. Our contacts, the town we’ve settled in, local volunteer opportunities, and all the places we’ve traveled to, provide amazing Spanish immersion for families! How does Common Ground’s Spanish Immersion for Families Program work? Safe and fully-equipped lodging. As a unique family with unique needs, you need the option of staying with a host family (depending on the family size), renting a house, or standard hotel accommodations. Whatever best fits your family’s needs! Your Spanish classes will take place Monday to Friday, and you will have time on the weekends to travel or spend with your host families. If you wish to stay in one specific location, there is always the option to visit the other available locations as optional excursions during a long weekend excursion! When is this family immersion trip available for families? Our programs are flexible, and we are available to make your trip possible any time of the year! Fill out the form below today and let us know which dates you are considering travel and other details about your plans. What are the related costs and inclusions for the Family Spanish Immersion Program with Common Ground? We work hard to keep the program affordable for families because we’d love to share Costa Rica and all it has to offer with you! We break down our costs to per person, per week, and our various locations have varying costs. We suggest your family rent a car while in Costa Rica, as it is the most convenient way to get around. Volunteer projects, day & overnight trips vary greatly in cost depending on location, length, and guide needs. We’ll work with you on a clear proposal for your Family Spanish Immersion program and work within your budget. What does it take to reserve my family immersion trip so we can begin planning our Spanish immersion? It takes a non-refundable lodging deposit to reserve your trip. The minimum deposit is $400 so that we can begin planning your Family Spanish Immersion Adventure. How do we get more information and get started? It’s easy to get started – Explore the different locations available for your Immersion trip by clicking the buttons above, and fill out the following form to let us know what you’re looking for so we can help you find your best options in Costa Rica! Do you prefer to just travel on a Family Vacation in a Spanish speaking area?… That’s OK too!